So it is the oxygen mask theory, and I know you’ve heard it a million times. The whole idea about if you take care of yourself, you’ll be able to take care of your kiddos. But, this is one area where I see the trickle down effect of my good choices immediately. And you know how everyone says breastmilk is liquid gold — and the very best thing you can give your baby? Well, the green monster is the best thing you can give your kids! And believe it or not, I bet you can get almost any kiddo excited about drinking it! First, get them involved. Take them to the store (or the Farmer’s Market) with you. Let them pick out the biggest carrot, the prettiest bunch of parsley, the craziest looking ginger root. Help them make their own. When I fire up the juicer, the girls love to gather around and throw in the veggies (with help and supervision, of course) and watch the juice come out each little squirt at a time. An orange is our secret ingredient. Once my juice is done, I put it aside and then I add an entire orange to each of the girls glasses. This sweetens it right up and makes it much more drinkable for them. Serve it small & cold. I don’t give them a big huge glass — even a shotglass full is better than nothing! And pour it over lots of ice! Drink up! YUM! 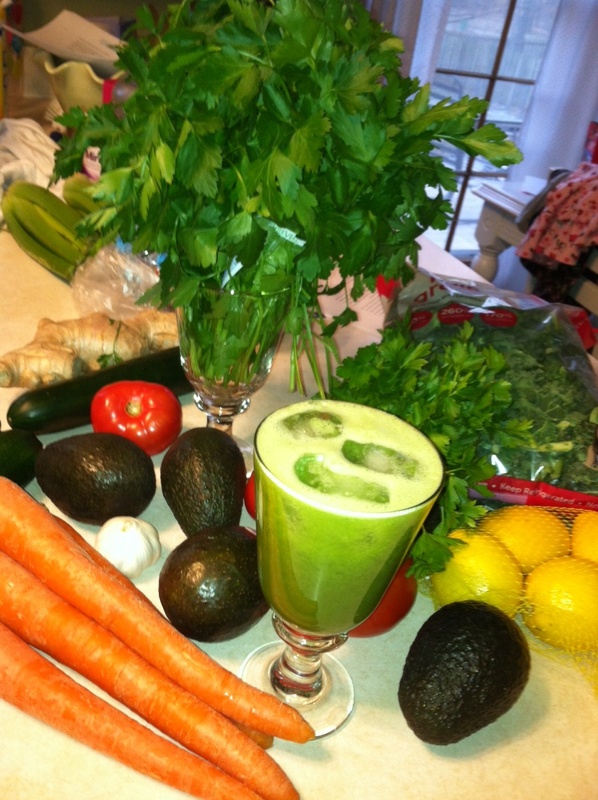 This entry was posted in Uncategorized and tagged avacado, children, farmer's market, ginger root, green juice, green monster, juice, juicing, kids, lemon, parsley, vegetables, veggies on February 2, 2013 by poseyplays.